A family owned winery founded in 2000 by Aron and Pam Hess. The focus at Daedalus Cellars was Pinot Noir, particularly from grapes grown in the Dundee Hills AVA in the Willamette Valley of Oregon. Production was performed at the 12th & Maple Wine Company, a custom crush facility in Dundee, Oregon, where Aron was the head winemaker and crafted wines for over 20 clients as well as the wines for his own Daedalus Cellars and Jezebel labels. Aron aimed for age ability in his Pinot Noirs which were crafted in a modestly rich style. Vineyard sources included Maresh Vineyard and Murto Vineyard, both in the Dundee Hills. 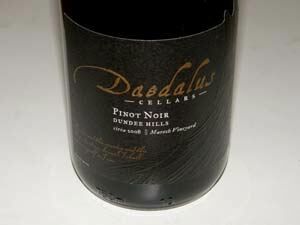 Production was approximately 3,000 cases of Daedalus Cellars wines and 5,000 cases of Jezebel wines. In 2009, Aron and Pam Walden Hess separated and the following year she took over the Daedalus and Jezebal brands. She replaced Daedalus with her own Willful Wine label. Sadly, Aron passed away in 2013.